***All new furniture, new full size under twin bunk bed, pull out couch(twin), new bedding and electronics*** This cozy condo is now almost brand new inside and is centrally located; with a few minutes walk to old downtown, 10 minute drive to world class snow at Whitefish Mountain (or take the free shuttle), 30 minute drive to Glacier National Park, and a 10 minute walk to the city beach at Whitefish lake you are never far from where you want to be. With two bedrooms (1 queen bedroom and full under twin bunk bed in the other), pull out couch, one full bathroom, and a complete kitchen the condo can accommodate up to 6 people. Whitefish Montana is truly a unique and exciting location. With a population of 6,700 located at an elevation of over 3,000 feet, the climate cycles through four very discernible seasons. The average summer temperature is close to 80 degrees and the winter month's average is in the low 20's. The area is easily accessed through Glacier Park International Airport, only 19 miles away. Whitefish Mountain is located in the Rocky Mountains of northwest Montana, near Glacier National Park, and 8 miles north of Whitefish. Snowfall provides ample winter entertainment opportunities including skiing and snowboarding, Super Pipe and Terrain park, Nordic skiing, snow shoeing, back country cat skiing, Glacier National Park tours, snowmobile tours, ice-fishing and full-moon dine and ski evenings. With 3,000 acres of terrain, Whitefish Mountain is one of the largest year-round resorts and offers state-of-the-art grooming, snow making, and 13 lifts including 2 high speed quads. Summers are accompanied by endless activities in the many lakes and rivers. While Whitefish maintains the small town feel, there is no shortage of summer fun including; fishing, boating, jet skiing, rafting, horseback riding, hiking, camping, great food, fun bars, shopping, and soaking in the sun at the beach. We have a 60 day cancellation policy. More than 60 days notice full refund minus $100 administrative fee. Less than 60 days no refunds. Stumptown Vacation Rentals offers a wide range of properties that suit the needs of anyone looking for comfortable accommodations in the Flathead area. The Flathead Valley is nestled into Montana's most pristine area for recreation. The Flathead Valley is a wonderful place to explore and create new memories with a plethora of activities available each season. Choose from our diverse selection of vacation rentals, with mountainside suites, Lakefront property, luxury Whitefish condos and picturesque chalets at your fingertips. 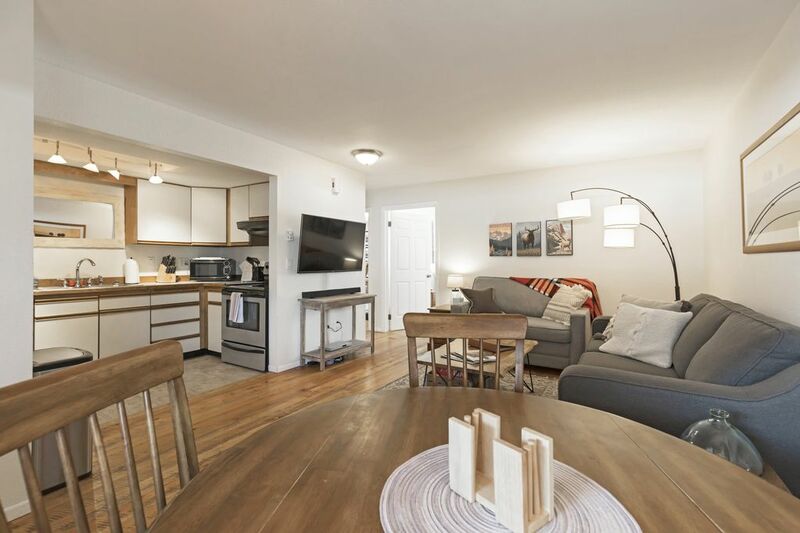 All Stumptown Vacation Rental Properties include the comforts of home with amenities such as fully equipped kitchens, digital cable and free wireless internet. Nice place. Noisy. Super location and parking. Double bed (not queen) and twin beds very small and soft. Beds were clean and comfortable. Kitchen decent. Manager was responsive to our needs. The bad part was a musty moldy smell that needed to be covered up with an air freshener. Additionally, smoking units nearby contributed to less than wonderful aromas and air-quality. Location was great, both train station and mountain very assessable without a car. I rented this condo for visiting family. They enjoyed being close to town and close to the family home. I thought being so close to the railroad would be distracting and noisy, but they said it wasn't. Thanks for having your family stay at our condo. I hope they had a great time. The trains park not far away but there is virtually no noise right down town. Found rental to be exactly as described. Very comfortable with nice furnishings and kitchen supplies. Manager and owner super responsive when we had any questions! Very nice and clean condo. Conveniently located to downtown Whitefish and loca tourist areas. A bit of noise from upstairs condo but not enough to disturb is at all. Loved the 10:00 noise curfew. We stayed here in June 2014 for a golf weekend. It was comfortable, beds were good, rest of the unit was basic, but as other reviewers mention, clean and worked well for us. There was no soap, even at the bathroom sink, so plan to bring your own. It is conveniently located to walk to shops and restaurants downtown Whitefish. The beach is a short stroll across the bridge and down the street. There is a very nice walking/biking path located very close to the condo. Our only complaint was the train whistle all through the night - we could not leave the bedroom windows open for ventilation as a result. OK in June, but as the summer gets hotter, it would be an issue. There is no AC in the unit. The only other drawback to the units in this building is a lack of patio or deck to sit outside. The owner was a little lax regarding documentation for our stay, which I found somewhat unsettling, however there were no problems upon arrival, so don't be put off by the lack of rental agreement, as it appears thats just the way the owner flys. He was quick to respond to a text the night we arrived to get us onto the wifi in the condo. Overall, a good basic accommodation at a very reasonable price. Several other units in this building are rentals, and they are all more expensive. We would consider this again for a short stay in Whitefish. $125/night prime season /.. $800/week .. $1800/month plus utilities. $110/night .. $700/week .. $1250/month plus utilities.